Will the Brisbane Broncos prove themselves genuine premiership threats? Or will the Melbourne Storm build upon last week’s victory over Newcastle? Join The Roar for live scores and a blog of the match, starting at 7:50pm (AEST). Brisbane have experienced an inconsistent opening to their 2018 campaign. Losses to the Titans and Knights saw experts questioning whether Wayne Bennett’s men would be any real threat in this year’s competition. However, the Broncos answered their critics last week with an unexpected win over the previously undefeated Warriors. Coach Bennett will be hoping his team can back it up this week and claim another confidence-building win when they take on the defending premiers. Brisbane recruit Jack Bird was highly impressive filling in for injured halfback Kodi Nikorima last weekend. As a result, the former Shark has been named to again play in the No. 6 jersey with Nikorima to start off the bench. Brisbane have another tough assignment on Friday night, however, as they prepare for a Storm outfit coming off a dominant 40-14 win. 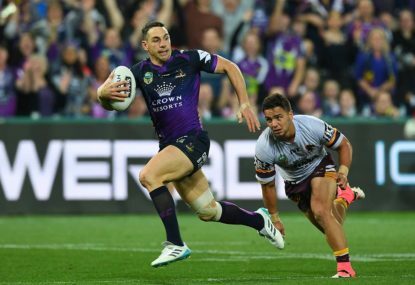 Craig Bellamy’s men reasserted themselves as premiership heavyweights with the 26-point victory. Halfback Ryley Jacks displayed the control that demoted rookie Brodie Croft was missing in the win and has wrapped up a position in the starting side for the near future. Coach Bellamy would have been pleased with his team’s completion rate of 87% last Friday night – a clear improvement given that they are currently the most error-riddled side in the competition. Prediction: The Storm looked to have turned a corner and should be too classy for the Broncos. Melbourne by 12. Join The Roar for live scores and a blog of the match, starting at 7:50pm (AEST).